Previous trials have shown increases in brain volume in people who participated in aerobic exercise, and in one of these trials, an improvement in memory was seen. However, this was the first trial to show that a less aerobic form of exercise, Tai Chi, as well as stimulating discussion led to similar increases in brain volume and improvements on psychological tests of memory and thinking. “The ability to reverse this trend with physical exercise and increased mental activity implies that it may be possible to delay the onset of dementia in older persons through interventions that have many physical and mental health benefits,” said lead author Dr. James Mortimer, professor of epidemiology at the University of South Florida College of Public Health. Research suggests that aerobic exercise is associated with increased production of brain growth factors. 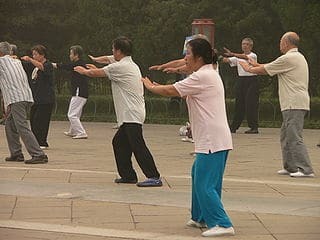 It remains to be determined whether forms of exercise like Tai Chi that include an important mental exercise component could lead to similar changes in the production of these factors. “If this is shown, then it would provide strong support to the concept of “use it or lose it” and encourage seniors to stay actively involved both intellectually and physically,” Dr. Mortimer said. One question raised by the research is whether sustained physical and mental exercise can contribute to the prevention of Alzheimer’s disease, the most common dementing illness. Only wanna talk that this is very beneficial, Thanks for taking your stretch to communicate this. “We can’t total be heroes being somebody has to roost on the bridle also applaud as they go by.” by Devise Rogers.